A graduate of Tokyo Gakugei University, Hiratsuka came to the United States in 1985 and received masters degrees from both New Mexico State University and Indiana University. He loves teaching, and has been a professor of printmaking at Oregon State University since 1992. The intaglio prints which Mr. Hiratsuka creates represent a fusion of East and West, with roots in both contemporary and traditional art. Hiratsuka has a distinctive personal style. Most often his subject matter is portraits, but the faces are rendered without eyes or noses. He says this comes from the Zen tradition in art, where both simplicity and suggestion are emphasized. Other elements can be thought of as stemming from traditional Ukiyo-e woodblock prints from the 17th-19th Centuries. They were brightly colored, sometimes humorous, and often featured poster-like caricatures of actors and other famous personalities. The contemporary influence is seen in his choice of Western-style dress, and such characters as chiropractors or beauticians. In each work, Hiratsuka allows the viewer to see his or her own interpretation in the ambiguous faces, while presenting the figures with an element of wit by using exaggeration and distortion. 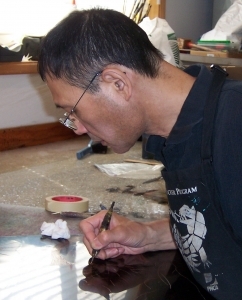 The techniques used by Yuji Hiratsuka include etching, drypoint, aquatint, soft ground and roulette on the copper plate. In addition, he may apply a scraper, burnisher or emery paper to enhance the light areas. The plate is printed four separate times with black, yellow, red and blue inks onto thin Japanese Kurotani paper. Before this paper is glued to a stronger ragpaper backing, Hiratsuka will apply hand color tints to the back side of the Kurotani paper. This means that each print in an edition may be quite unique.